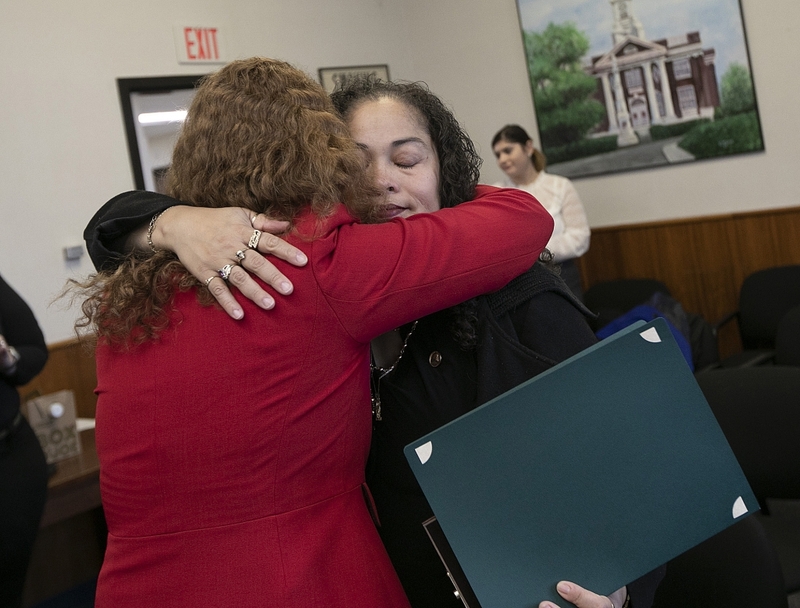 U.S. Rep. Elizabeth Esty, left, hugs Jessica Vega, mother of the late Carnegie Hero Jay Agli, during the Nov. 19 presentation of Jay’s posthumously awarded Carnegie Medal in a ceremony at the city hall in Meriden, Conn.
Jay, 17, of Meriden, died attempting to save his sister, Kishana M. Rivera, from drowning in the Connecticut River at a state park in Haddam, Conn., on June 11, 2017. After Rivera was in the water and struggling to return to a sandbar, Jay entered the river despite not knowing how to swim. He submerged and drowned; boaters removed Rivera from the water downstream. The ceremony was timed to what would have been Jay’s 19th birthday. At the time of the presentation, Esty represented Connecticut’s fifth district. Meriden Mayor Kevin Scarpati also presented a citation from the city to Vega.